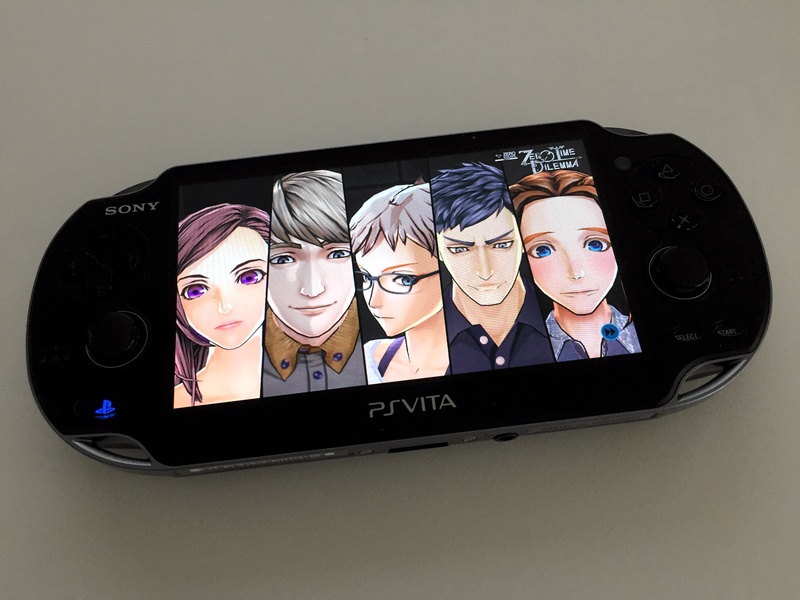 I picked up Zero Time Dilemma last week on the PS Vita, and it’s really reminded me why the PS Vita is my favourite console. While Nintendo’s 3DS lineup may edge out the Vita in terms of social integrations (StreetPass is a hell of a thing), the PS Vita remains the more “serious”, the more mature console. Not because it doesn’t have a cutesy interface like the 3DS, but because it lacks the simplifications of the 3DS that make it the more appealing to a younger audience. Like a lot of 90’s kids, I grew up on Nintendo. My friends had the Nintendo 64, I eventually got a GameCube, and there were various portables interspersed throughout all that. The Game Boy Color introduced me to portable gaming, and by the time the Game Boy Advance SP rolled around, I was hooked. (I borrowed a friend’s Game Boy Advance for a few weeks, which was pretty cool, but I never had one of my own.) I picked up the original 3DS when it came out, but by that time I had more or less outgrown portable gaming, eschewing it in favour of these new-fangled “computers”. Fast forward a few years. I haven’t played Pokémon for far too long, but I get the chance to acquire some 3DS hardware for cheap. I jump at the opportunity, with the intention of sating my desire to catch pocket monsters for another decade or so, publishing a series of posts about the fun I was going to have. Unfortunately, whether it was due to Poké-fatigue or something else, I never ended up finishing Pokémon Y. Somehow, I ended up buying a PS Vita in the middle of that. I imported it from the US due to Sony being much more lenient with their region-locking than Nintendo was, and I spent a good chunk of time in Persona 4 Golden which I later wrote about. By the same token, the growing library of titles on the 3DS meant that it was now a compelling purchase. I remember reading about Fire Emblem Awakening somewhere, and feeling it was a good a time as any to jump in, I imported a 3DS XL from the US along with a physical copy of Fire Emblem Awakening. 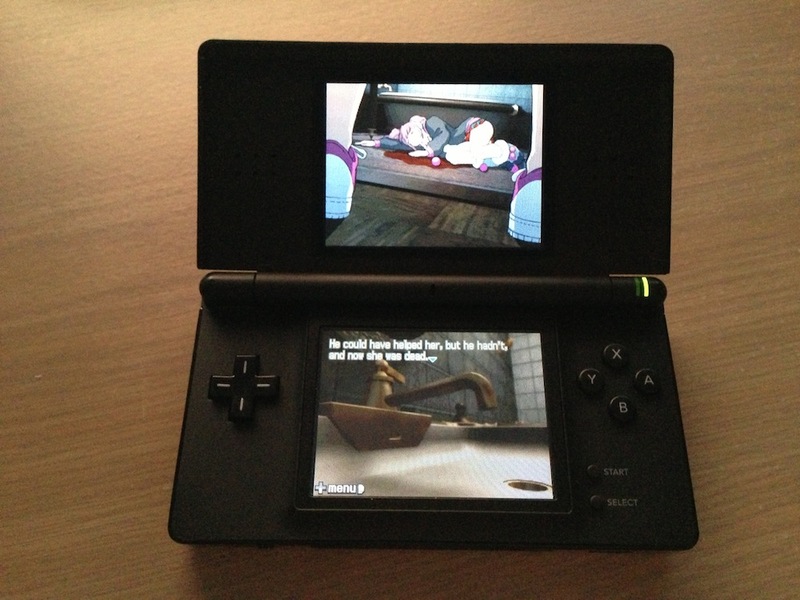 The 3DS XL was pretty great, despite Nintendo’s insistence on region-locking its titles. My imported 3DS meant I was never going to be able to walk into my local EB and pick up a 3DS game on a whim, but I was OK with that, thanks to increased digital availability of titles. I took my 3DS XL to PAX Aus the first and second times, and StreetPass really came into its own as the ultimate social drawcard, even if it meant walking around holding the right shoulder button and giving A a solid workout. But for all of the 3DS’s many compelling titles and social integrations, there’s always been something off about Nintendo’s portable console. I can’t quite put my finger on it, but it feels as though the 3DS is still a console for kids — maybe because it is — but it means that there’s this feeling of something missing. As in, why isn’t there any easy way to take screenshots on the device to save moments in-game? In a world of super-high resolution displays, why are the screens on the 3DS still the same low-res that we were seeing five, ten years ago? And that’s not even talking about the seldom-used 3D feature — although it’s cool that Nintendo has come up with a way for glasses-free 3D to work in a portable console, the fact that 3D cuts the resolution in half should mean Nintendo would want to be cramming the highest quality display possible into the 3DS, at least for the upper display. Which platform do I play this on? It’s been two and half years since I last played my Vita. Bonus points if you can name the games. One of the best things about modern gaming is being able to choose what platform to play something on. Console exclusives have more or less died out apart from a few titles that I’m not really that interested in anyway, and I can probably count the number of games that I want to play that aren’t on a platform I own on one hand, so life is pretty good when it comes to choosing which platform I want to play something on. Nine of out ten times, I’ll choose to play something on PC. I have a reasonably powerful gaming PC that’s purpose-built for the task, so putting all that graphics power to the task of pushing some pixels around is more productive than having it just sit around, looking pretty. Playing on PC means I get all the extra goodies that come with PC gaming: ShadowPlay to record in-game footage I want to watch later, and Steam integration for screenshots and for when I feel like being social and playing with friends (or to see what my friends are playing). Note that I don’t have a current-gen console at the moment, either. I used to have an Xbox 360 and a PS3, but I left those behind in Hobart when I moved to Brisbane in 2015. Some times I miss those consoles — there’s still a few PS3 games I’d like to play through — but for the most part, I haven’t felt like I’m missing out on anything by not having a console. Besides, these days I’m playing way too much Dota to get stuck into anything else. When Zero Time Dilemma came out at the start of July this year, I faced a dilemma: which platform should I be playing this on? I immediately purchased it on Steam due to the fact that it was the first title in the series that was available on PC. I didn’t have much of a choice with 999. Although you can play 999 on iOS these days, it lacks the puzzles of the 3DS version which I played through a few years ago. 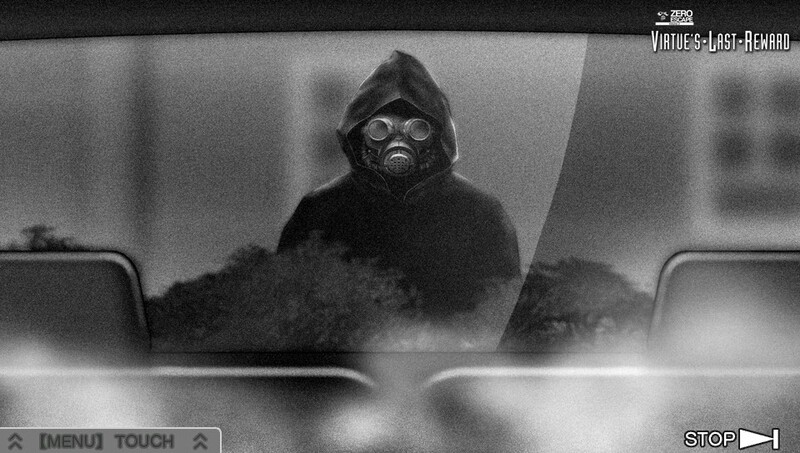 For Zero Time Escape, I went with the Vita version for something a little different. 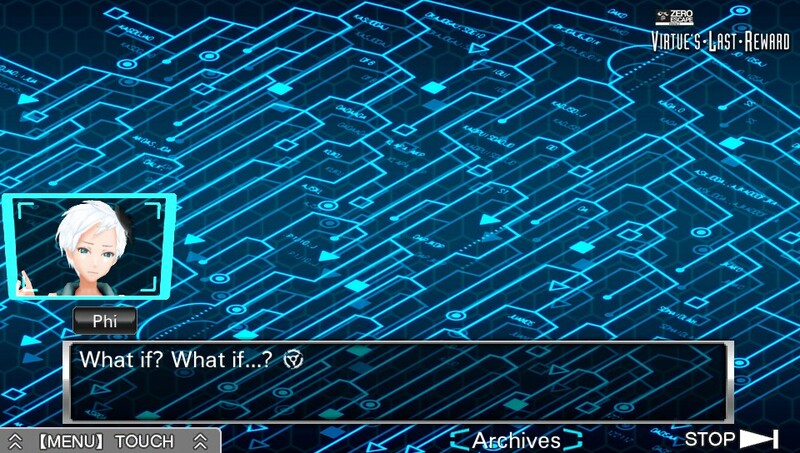 I tried playing Zero Time Dilemma on the PC, I really did. But the advantages of the PC platform just weren’t there. It’s not a bad port, per se, but using a mouse and keyboard for what is generally a pretty hands-off game/visual novel interspersed with puzzle sections felt wrong somehow, like I was doing more work than just playing the game. 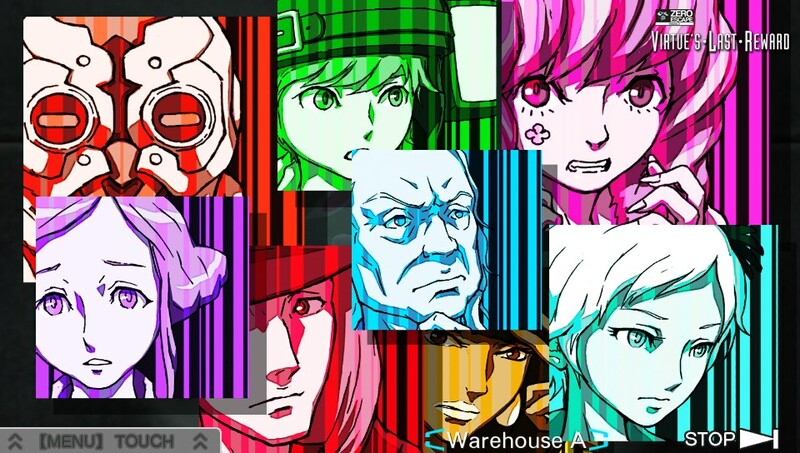 I could have gone with Zero Time Dilemma on the 3DS, too. I generally like the cutesy nature of the New 3DS, and Nintendo’s insistence on keeping games on their own platform forces my hand more often than I’d like. But here, the lack of an actual screenshot function would have let me down if I ever wanted to do a little write up — if I can’t go back and review the screenshots of the game I’ve played, did I ever really play it? So it was settled. I asked my sister to ship me my PS Vita that I bought back in March 2012, and as soon as I arranged for some US PSN credit and downloaded Zero Time Dilemma, I knew I had made the right choice. Great piece from David Pogue on what I was writing about just a few short weeks ago. His piece is much better written than mine is, but I guess that’s why they pay him the big bucks. In the world of cameras, only Sony are doing anything that really interests me right now. By putting big(er) sensors into small(er) cameras, they’re improving image quality without sacrificing portability. They’re improving low-light and noise performance without having to go to ridiculously high ISOs or invest precious R&D into new noise-reduction algorithms. They’re doing the right thing, or at very least, moving in the right direction. It all started with the RX100, released just last year, a compact camera with a non-detachable zoom lens and a comparatively massive 1-inch sensor, the largest in its class. It was the first camera to put a big sensor in a body that was still extremely pocketable, and it was the first camera that offered anything close to the low-light performance of cameras with much larger sensors. Not surprisingly, the RX100 received rave reviews despite the slightly higher price point — it was decidedly an “enthusiast compact” camera, and the price reflected its status, but it was still on the expensive side for people looking for an alternative to similar cameras such as the Canon S100 or S110, both of which retail around the $300 mark — by comparison, the RX100 is easily twice that price. 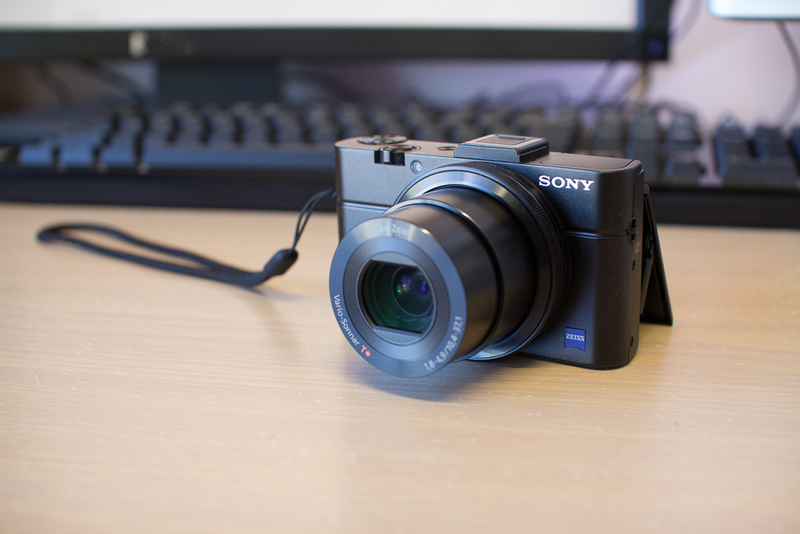 Regardless, the RX100 was a big hit with the wider photographic community. Someone at Sony must have decided this was a worthwhile path to pursue, because half a year later we saw the introduction of the RX1, the first camera to put a full-frame digital sensor in a compact camera. Not much bigger than the RX100, the RX1 is stil a hell of a lot more compact than any other camera with a large sensor, let alone a full-frame DSLR. Like the RX100, the RX1 comes with a non-detachable lens, but unlike the RX100, the lens on the RX1 is a fixed-focal length lens (commonly referred to as a prime). The lens permanently attached to the RX1 is a 35mm f/2 Zeiss, and I for one am glad Sony chose to go with something decent for their choice of lens. Thanks to the combination of quality glass and a full-frame sensor, image quality, low-light image quality and noise performance all improved markedly. The only real downside for consumers was the price: at close to what you might pay for a comparable full-frame DSLR, the RX1 is out of reach for anyone who actually wants a full-frame sensor in a compact body without the convenience of interchangeable lenses. 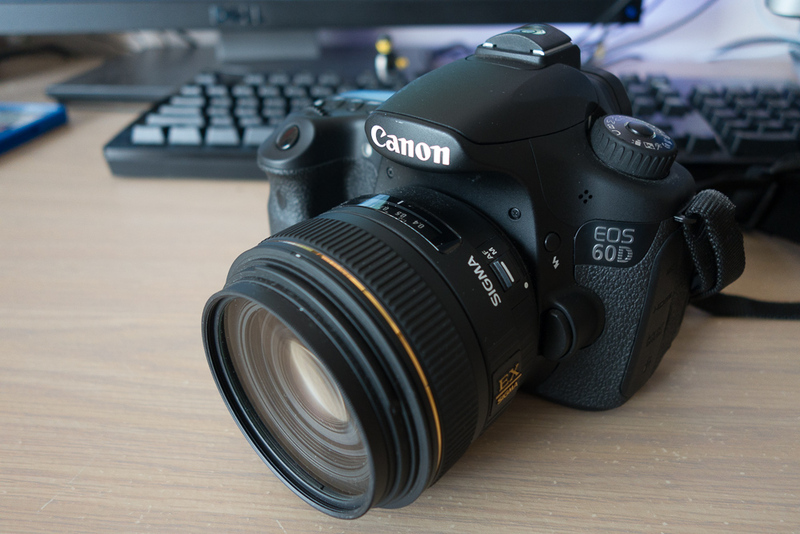 You’d have to be a serious enthusiast (or flushed with cash) to fork out for a camera you bought for its size alone, especially when you can get a professional DSLR for around the same kind of money. Nevertheless, like the RX100 before it, the RX1 was heralded as a breakthrough in digital camera technology simply because it was the first camera to include a full-frame sensor in a compact-like body. 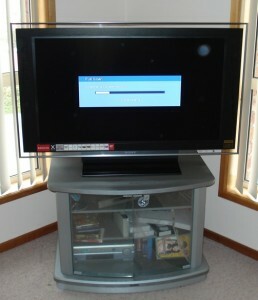 It, too, received rave reviews, despite its expensive price tag. By this time, Sony had caught onto what consumers really wanted: DSLR-like image quality from compact cameras. The RX100 II followed with improvements to the general formula, including a new image processing chip for even better noise performance, coupled with the same big sensor in a compact body. Around the same time, Sony also released the RX1 R, a variant on the original that removed the anti-aliasing filter in favour of more effective resolution and slightly sharper images at the cost of possible moire when capturing certain lined patters. I’ve been thinking about buying a 3DS XL for Fire Emblem Awakening, but Nintendo’s decision to region lock their hardware is making it harder than it should be. In an ideal world, I’d be able to walk in to any good gaming retailer in Australia, pick up a 3DS, and be on my merry way. And in theory, I can totally do that — provided I’m happy with missing out on a massive (okay, decent) selection of games. Thanks to a combination of region locked 3DS hardware, strange decisions by publishers, and the very nature of a Japan-centric games company, if I buy an Australian 3DS it means I might not ever get to play titles that are released in the US. That’s crazy. To be fair, this has always been an issue for Nintendo. I completely understand when games are released for the Japanese market that aren’t available in other regions, as much as I want to play the latest Phoenix Wright or Professor Layton title at the same time Japanese folks get to. I get that titles need to be localised for non-Asian markets, voices need to be re-done, etc. But when titles suffer lengthy delays or aren’t released for other markets outside the US, then that’s when I start to take notice and get angry. Fire Emblem, for example, was released in the US back in February. Europe and Australia, however, didn’t get it until late April — why? What possible reason could the publishers have to delay a title that was already localised for English markets an entire two months after the US release? No possible reason that makes any kind of sense. I already own a PS Vita, and for the record, Sony does a lot better on the region locking front for the simple reason that the console and its games aren’t region locked. At all. The US and Australian PlayStation Stores are different regions as you might expect, but I’m no stranger to that — the iTunes Store is exactly the same. If you buy a Vita, you can set it up with the US PSN store pretty easily, and your console will buy and download games no problems. Switching between the two stores can be done, but doing so frequently isn’t practical as it involves a device reset every time. 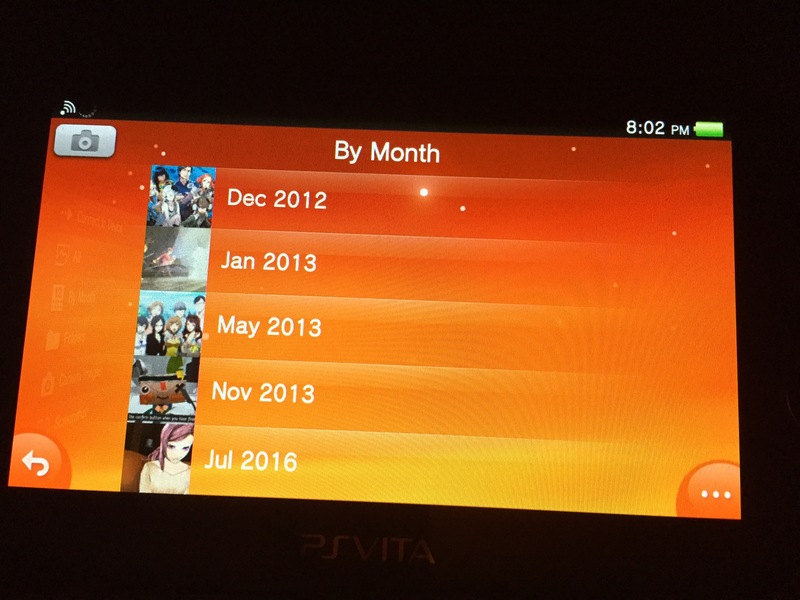 In the year or so I’ve owned a Vita, I’ve never wanted to switch to the Australian PSN, and I can’t see this changing anytime sooner — the game selection on the US PSN is far superior to the titles offered on the Australian PSN, games are released earlier, and they’re usually cheaper, too. If I want to access a larger selection of games and games released months earlier (and, not to mention, cheaper), then it seems the obvious solution is to import a 3DS XL from the US, right? Nintendo, in their infinite wisdom, also region-lock their games. A US Vita can play Australian-bought games just fine, but a US 3DS will only be able to play games bought from the US. No problem, I can just download them directly from the eShop and call it a day, right? Wrong — I don’t know whether it’s a publisher thing or just a Nintendo one, but for some crazy, insane reason, about half of 3DS titles sold at retail can’t be bought from the eShop. Again, don’t ask me why, because I just don’t know. In contrast, the PSN offers a much wider selection of games than are offered at retail: not only Vita-exclusive titles, but also PSP ones, PS One classics, “minis”, and the best thing about it is that every title released at retail is available for direct download on the PSN. Like it should be. So if I do buy a 3DS from the US, here’s how it stands. I won’t be able to buy local titles. No big loss, but it does kill off that instant-gratification factor that comes with buying from a brick-and-mortar. Any game I do want to buy which can’t be bought from the eShop (about half of all the titles available), I’ll have to import from the US — although given the lead times for Australian games so far, any delays in getting the game due to shipping will still mean I get the game before it’s released locally. My point in all this is that it shouldn’t be this hard. 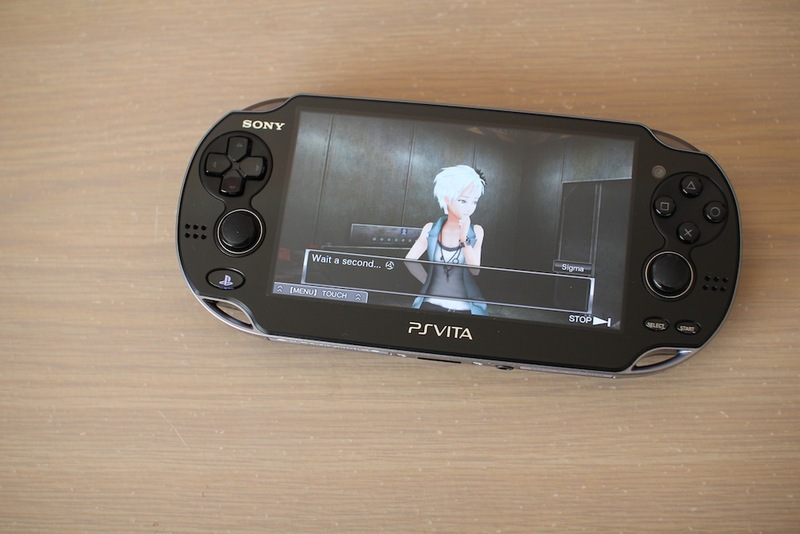 The Vita and its games aren’t region locked in any way, and that’s a massive plus in my book. Anything else is making it harder than it really should be. Now, if only Amazon had the colour 3DS XL that I want in stock, and if only they would ship it to Australia. But that’s a tale for another time. You haven’t finished this playthrough. There’s more after the jump. 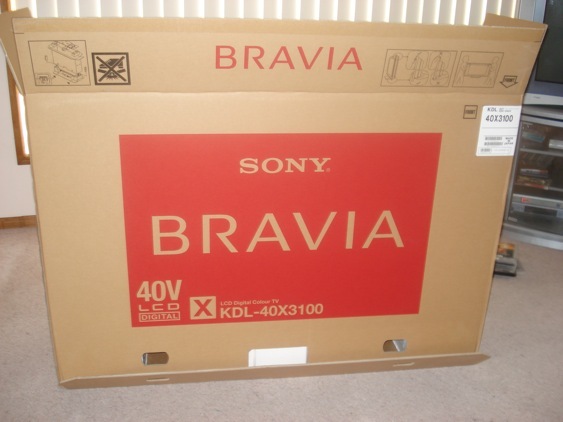 Update: I thought you guys might like an explanation of why there’s a new Sony X-Series LCD sitting in my lounge room, and it’s because, well, the old TV was getting old. Besides, we wanted an extra channel to watch, as well as digital (ooh!) 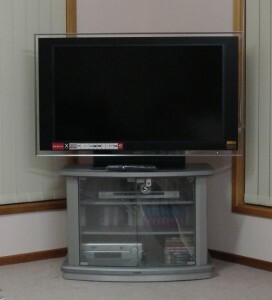 TV. I’m enjoying it immensely – it is by far the best TV my family has ever owned.